Monitoring your credit report and credit rating is important, especially if you’re considering purchasing a home. 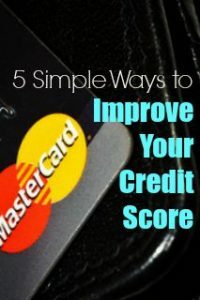 Here are five tips for improving your credit. It’s not about quick fixes, but responsible financial activity over time. Get a credit card: OK, this may seem counterintuitive, but let me explain. When used correctly, a credit card can be an effective tool for building credit. Charge a few budget-conscious purchases each month, and pay the balance off before your due date. Keep your balance low: This is the other side of the coin with credit cards. Try to only charge for items you could pay for out-of-pocket, and try to stick to a balance of only 10 percent of your credit limit. Food: If your kitchen is being torn apart, preparing meals becomes a lot more difficult. You may be able to keep your food budget steady by switching to meals that don’t require counter space, the stove, or the oven, but don’t be surprised if you end up dining out more often. Ask! If you’re looking to pay off a debt quickly, it can’t hurt to ask the lender to lower your interest rate. You can’t get what you don’t ask for! Thinking of Building? Know Your Options! Unlike buying a new car, new homes don’t loose their value as soon as you buy them. In fact, they can be a better investment than a used home if you choose the right builder and have your home built in the right location. New homes have come along way over the years and if you want the latest and greatest in your next home, new construction is the only way to go. Finding the right location, however, can be a bit hard if you don’t know what you’re looking for. New Construction Homes have all of the latest energy efficient and smart home functionality. Getting a new home warranty is another benefit when buying a new construction home. 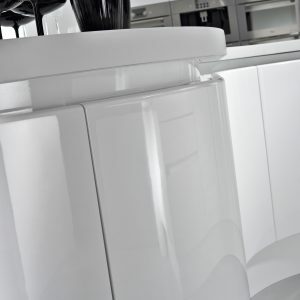 While you can buy a home warranty with a used home, it normally only covers the appliances and minor coverage on the systems of the home like electric, plumbing and HVAC. The State of Mississippi mandates that all new home builders must warrant their home’s build quality and systems for 1 year and structural for 6 years. Check out the Mississippi Home Warranty Act for more information. There are many pitfalls in building a new home, so we decided to go over a few of them here. All agents at NextHome E-Realty have worked for multiple builders and have vast knowledge in new home building along the Mississippi Gulf Coast. While many builders try to take care of their customers, many do the minimum to get to the end. There are really two types of builders you will be dealing with in single family residential homes. The first is a Production Home Builder which builds you a home with hardly any changes that you can make. The second type is a Custom Home Builder which is just the opposite. They do mainly what their name suggests… build you a custom home that fits you exactly down to the door knobs and plumbing fixtures. Let’s take a closer look at both types. Essentially, production home builders build the same homes over and over and they’ve gotten very good at it. The more efficient they get at it, the more they can bring down their cost of the home and pass that saving along to you. Production builders also build on their own lots in their own subdivisions that they sometimes have developed. The main three production builders on the Mississippi Gulf Coast are Adams Homes, DR Horton and DSLD Homes. All offer to pay closing costs as long as you use one of their preferred lenders. While value seems to be the biggest focus for production builders, they don’t give you the ability to make changes to their plans. 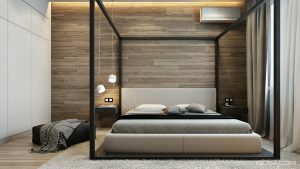 This means that you will most likely have to compromise on your home’s design. If production home builders offer the best value, custom home builders offer you the best design… at a price. So if you need some specifics in your next home, custom home builders offer you the best peace of mind because ultimately, you’ll be the one having to live in the home. There’s nothing more annoying than to be reminded daily you should have chosen to build your home differently after you move in. Having a home builder that asks the right questions eliminates this way up front. You need to discuss how you live in the home, not just how many bedrooms and bathrooms you need. 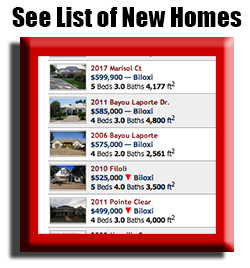 The most well known custom home builders along the Mississippi Gulf Coast are Elliott Homes, Fritz Homes, Shepard Homes and Sapphire Homes. 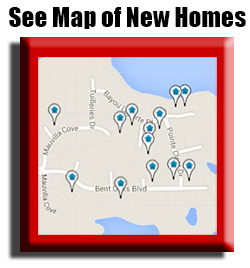 Have a New Construction Home Builder in Mind? Remember to contact me first before contacting any new home builder. They have their own sales staff representing the builder’s interest and I will be representing your interest. The great part about having me on your side is that it costs you absolutely nothing. I get paid by the builder, but as the state mandates… I represent you! If you have already visited the home builder’s model home, it’s okay! I can still represent you as long as you have not signed their construction agreement yet. So, contact me now to get started! Even the most happy-go-lucky dogs and cats have some preferences about the spaces they occupy. 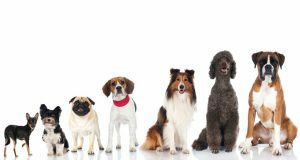 If you want to keep you pet as happy and comfortable as possible, here are some things to take into consideration when looking for a dog friendly home. Carpet is more comfortable for your dog when it comes to laying down and sleeping, but it’s also preferable when your dog is on its feet. 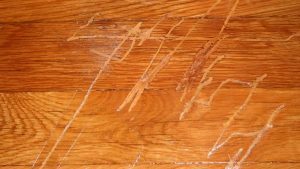 Dogs typically don’t like hardwood floors because they feel less traction under their paws. They may even try to dig in with their claws to improve traction, possibly damaging your floors. As a compromise, you can place soft, thick rugs on the floor to help your pets relax. You can also place booties or rubber rings on your dog’s feet for better grip. You’ve surely seen a dog get spooked by the sound of 4th of July fireworks. 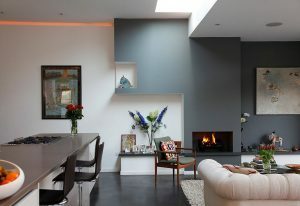 A fireplace isn’t nearly as loud, but can still have a similar effect. Plus, those pops and crackles from the flames are a far more regular occurrence. 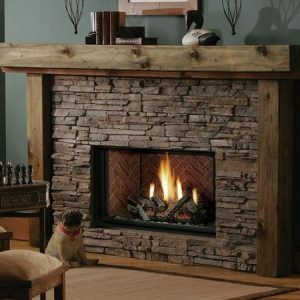 A quieter gas fireplace is more dog friendly. You can also give your dog a chew toy or bone as a distraction before lighting a fire. 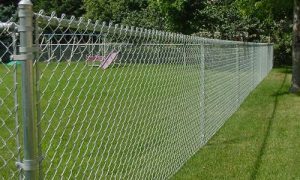 A chain-link fence can cause stress for your dog, because it can still see other animals and strangers, but is confined to the yard. If you’re considering a new fence, your dog will appreciate a solid one made of wood or vinyl panels. With fewer lines of sight to the outside, your dog will be less anxious. Can you cut your Cable bill? More and more people are cutting the cord and going without television service, but for many—especially those who watch a lot of live programming— cable is still a necessity. Cable and satellite companies love to sign customers to a two-year contract, but will dramatically raise your bill when a promotional period ends after one year. Suddenly, you’re paying $50 or more per month for the same services. Here’s how to get (and keep) the best deals on television service. Know what’s in store: Cable and satellite companies seemingly make it impossible to go online to downgrade your services, cancel service, or choose a new bundle. Even online chat support gives the cable company the upper hand. Picking up the phone and negotiating remains the best way to get the lowest price for your television service. Knowledge is power: Before you call, do some research. 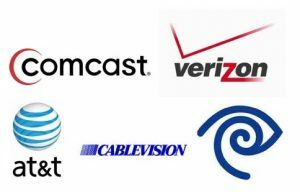 Understand the terms of your current contract, see which bundles your cable provider is currently offering to new customers, and price out similar service offerings from other companies. You’ll be in a better bargaining position if you have the freedom to cancel on your current provider. Make the call: Make it clear to the support representative that you are calling because your rates have increased and you’re considering cancelling if they cannot lower your bill. The support representative will initially try to offer higher-priced bundles or short-term freebies, but don’t give up on the negotiation—remember, you already know you can switch to another provider. 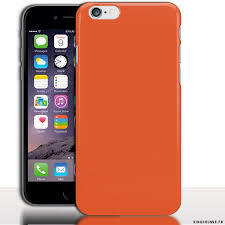 If the sales representative won’t budge, you can even end the call, and try again with a different representative. In most cases, they would rather find a package that works than lose a customer. 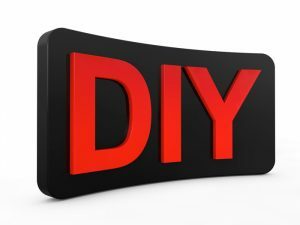 Is there a DIY home maintenance project that’s been lingering on your to-do list for too long because you’re dreading the trip to the hardware or craft store? 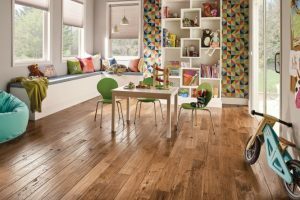 Here are some projects you can tackle with items that are almost certainly already in your home. 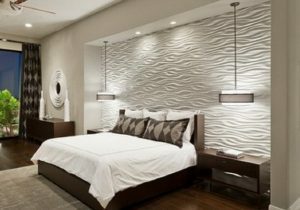 What Kind Of Accent Wall Would You Do? Is a 20% Down Payment Really Needed Today? 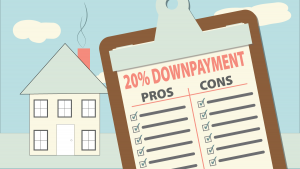 You’ve most likely heard the rule: Save for a 20% down payment before you buy a home. The logic behind saving 20% is solid, as it shows that you have the financial discipline and stability to save for a long-term goal. It also helps you get favorable rates from lenders. But there can actually be financial benefits to putting down a small down payment—as low as 3%—rather than parting with so much cash up front, even if you have the money available. The downsides of a small down payment are pretty well known. You’ll have to pay Private Mortgage Insurance, on some loans, for years, and the lower your down payment, the more you’ll pay. You’ll also be offered a lesser loan amount than borrowers who have a 20% down payment, which will eliminate some homes from your search. The national average for home appreciation is about 5%. The appreciation is independent from your home payment, so whether you put down 20% or 3%, the increase in equity is the same. If you’re looking at your home as an investment, putting down a smaller amount can lead to a higher return on investment, while also leaving more of your savings free for home repairs, upgrades, or other investment opportunities. Of course, your home payment options aren’t binary. Most borrowers can find some common ground between the security of a traditional 20% and an investment-focused, small down payment. Your trusted real estate professional can provide some answers as you explore your financing options. Why all the different paint types?